How Far is GR Shruthi Nivas? 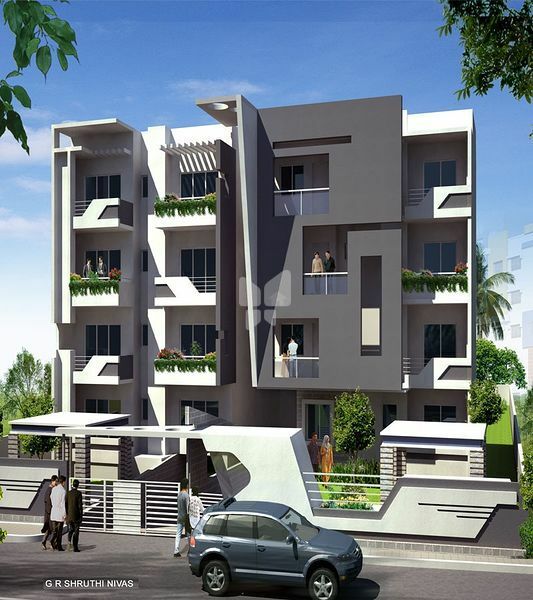 GR Shruti Nivas is one of the popular residential development of G R C group in Bangalore . This project offers spacious and thoughtfully constructed residential apartments.This project has been designed to facilitate perfect living conditions with optimum light, ventilation and privacy, coupled with fresh and green surroundings, each apartment brings the joy of unhindered living. Concrete 6/4 Hollow / Solid Block Masonry. Elegant entrance and common areas with Sadarahalli Granite. Basement Car Parking (IPS Finish). Vitrified flooring in living and dining room. Vitrified tile flooring for kitchen. Ceramic tile flooring for balcony and utility. Main door and internal door with teak wood frame (Ghana). The main door will be of teakwood panel. Internal doors will have teakwood veneer finish. Windows provided will be U.P.V.C framed windows with 4 mm clear float glass. Ceramic Glazed tiles dado up to a height of 7 feet in all toilets except mirror area. Parryware/Cera or equivalent make sanitary ware. Jacquar-Continental or equivalent make C.P fittings. Plumbing concealed in medium class CPVC / P.V.C Pipes. All external plumbing, waste water pipes and storm water drains shall be in combination of PVC and Stoneware pipes. 20mm black granite platform and stainless steel sink with drain board of reputed make. 2 feet glazed ceramic tiles dado above granite platform. Fire Resistant electrical wire of Anchor / equivalent make. Elegant modular electrical switches of Anchor / equivalent make. 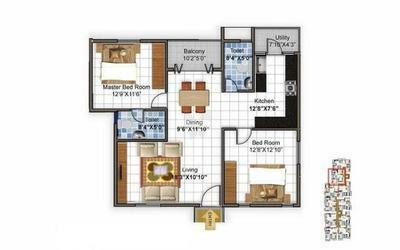 Telephone and Television points in living and master bedroom. Exterior ACE or equivalent shall be used. Doors The main door shall be provided with melamine. M.S grills and railings Synthetic enamel paint shall be used. Just in a decade G.R.C Group has been growing projects in Bangalore with utmost quality and excellent livelihood environment uncompromising quality standards, transparency for the people in India. A highly customer driven company G.R.C Group aims to provide top G.R.C technical excellence impeccable quality, airy & spacious accommodation & completion on schedule, clear titles, & a concern for surroundings, and the society at large. We seek perfection in all we do. The GR Shrushti built with perfection to detail stands majestically with 1,2,3 BHK Apartments in Choodasandra, Harlur, Bangalore. The GR Sankalpa one of the prestigious projects of the builder is pelted with 2,3, BHK Apartments in Off Sarjapur Road, Sarjapur Road, Bangalore. The GRC Brundavan another major landmark of the builder placed in one of the major residential hubs of the city with 2,3 BHK Apartments in Nayadandahalli, Mysore Road, Bangalore. The G.R.Constructions widely catering real estate properties has been successful in residential so far. The builder is also known for the uniqueness in every project, many projects by the builder still remains to just show the name of the builder as G.R.Construction. We believe that buildings should reflect engineering excellence with the outlook of providing customer satisfaction. As a team, we develop new plans time to time true to Determine work approach. We take pleasure in being community focus organization and concentrate on wide spectrum of construction desires. The momentum at which we have journeyed development has given us and incredible satisfied customer database. Which is a sign of deep passion and expertise that we have in our team. Livelihood freedom is not just about buying an apartment, but it is about ideas via the natural elements like soil, radiance, current of air and water in a method so that they vibrate staying inside the home. The developer is a creator of livelihood freedom. To build homes showcasing engineering excellence with unmatched value for money. To create cozy livelihood environment without compromising on quality standards. To cater to the customer needs with technical excellence and impeccable quality. To build homes integrated with natural elements by giving ample scope for spacious accommodation. To adhere to the highest ethical standards in terms of on time completion of projects, clear titles and a concern for surroundings. To provide professional services of talented engineers, designers, and other executives to our valued clients. To extend the very best in the industry- residential property to our customers who choose to be a part of our family. To be at the forefront of property marketing and to provide tailored innovative solutions that fit our client’s individual property requirements. To provide our clients the very best service in all aspects of residential requirements, which includes the handling of sale or purchase of properties. To personally assign such activities to our team of associated property experts.